Whitelow Hill and Cairn, Shuttleworth, from a nearby hill. Whitelow Cairn (looking up at the Western side). OS grid reference: SD 8049 1627. 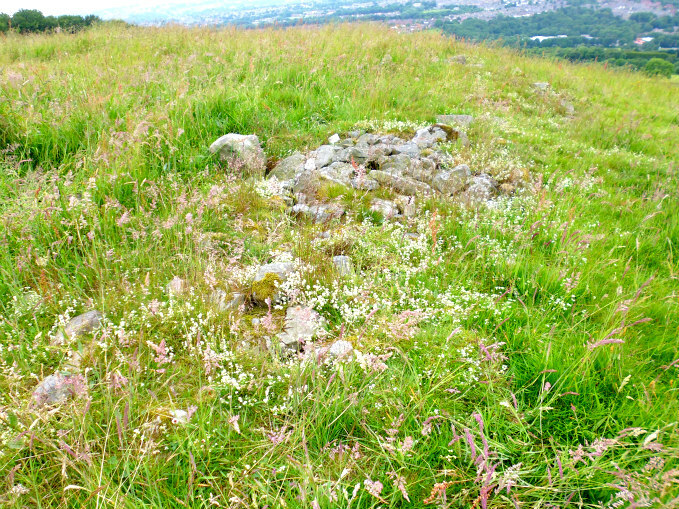 On Whitelow Hill up above the village of Shuttleworth, near Ramsbottom, Greater Manchester, there is a prehistoric cairn, cairn circle, or ring cairn, on what was a sacred hill to the ancient people – the “low” part of the the site’s name being evident in this case. 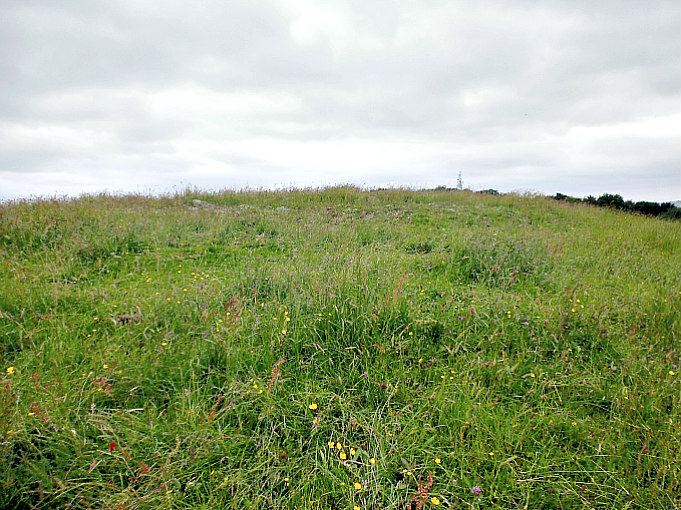 The burial mound is quite a ‘large and prominent feature’ and in the centre there is a cist grave, which is now almost destroyed. Whitelow cairn can be reached from the A56 (Manchester Road) in Shuttleworth, opposite the Bury Old Road turning. Walk up the “very rocky” Whitelow road to the east for 180m, branching off to the right around the edge of Whitelow Hill for another 220m. There is a gate on the right. It is best to proceed by this gate up to the hill and the cairn, which is at the north side. Whitelow Cairn (outer bank north-west side). Whitelow Cairn (outer bank south-east side). 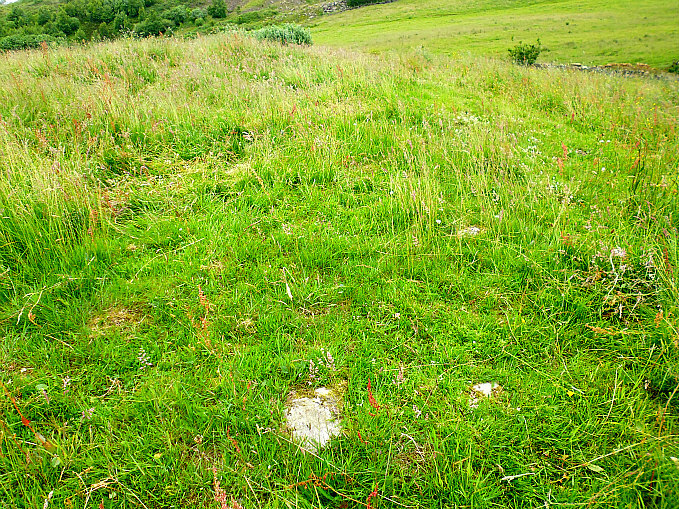 The large oval-shaped cairn here at Whitelow measures 26m x 24m and has a diameter of 27m. It has a well-defined outer ‘stone’ bank or kerb, especially N and E sides, that is slightly raised. There are some large stones embedded at intervals at the S side, some beneath the grass, whereas the kerb at the E, N and W sides has smaller stones, in little piles, at intervals on top of the slightly raised bank; the kerb at the N side is quite a prominent feature and can be seen from the hill to the north-west. At the centre of the ring cairn is an inner cairn or cist burial, now almost destroyed but still with its pile of stones. The hole or hollow can clearly be seen underneath the stones. Some of these stones clearly look to be shaped and would have originally made up the burial chamber, the large stone looks as if it originally covered the grave? but nothing much remains of that now as many of the stones have gone to be used in nearby walls. Adjacent to the cist, just a few feet away, is a larger stone on its own. 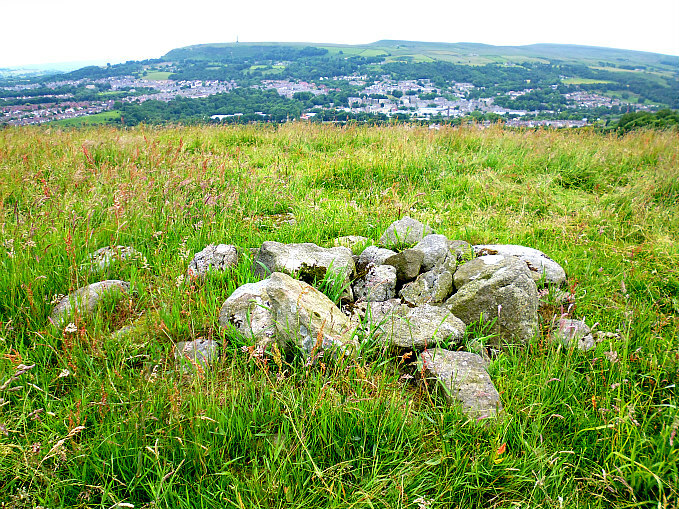 Whitelow Cairn (cist grave at the centre). 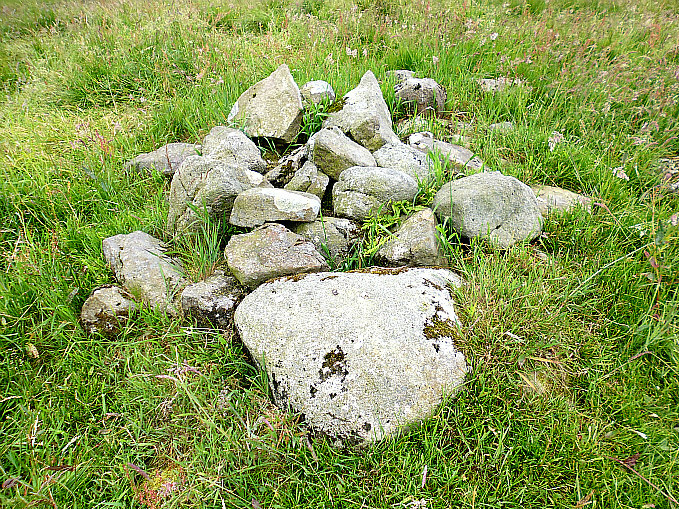 Whitelow Cairn (cist grave from the north). 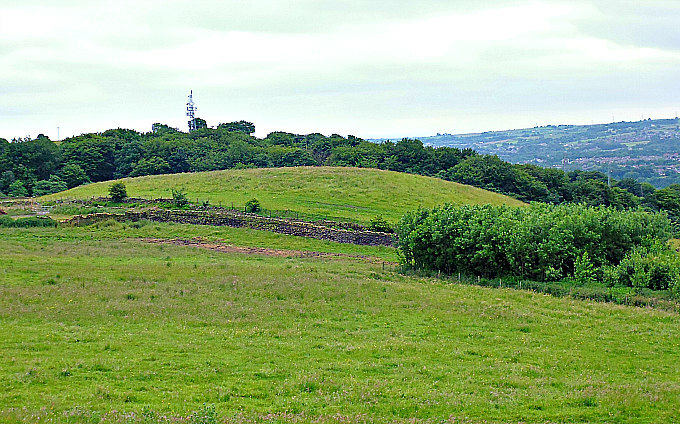 Excavations were carried out at Whitelow Hill between 1960-62 by Bury Archaeological Group. Twelve or thirteen cremations were discovered – five or six of these cremations being in collared urns. Also found were flint and chert flakes, two clay studs, and two halves of a bronze awl, all dating from the early Bronze-Age (the first half of the second millennium BC). Apparently there used to be at least three more cairns in this area, all situated close to the lane (the old Bury road) which runs to the east of the main site, though these have, sadly, been lost to quarrying and farming. That being the case with Bank Lane Cairn, just north of Whitelow Hill. However, there are what ‘might be’ two cairns (tumuli), although now very faint, in the field over to the southeast at SD 8058 1612 close by the kennels on Bury Old Road. However these two “possible” circular features are not recognizable at ground-level. The finds from Whitelow Cairn are housed in Bury Museum. Categories: Cairn / Cairn Circle | Tags: Whitelow Cairn near Shuttleworth in Greater Manchester | Permalink.